Years of fishing the Cape Cod Canal have equipped me with a strange ability. I can set the alarm for any time — 2:37, 3:11, 1:55 — and wake up one to five minutes before it goes off, almost without fail. This is a defense mechanism that comes from sleeping next to a very understanding wife. I think my subconscious knows that her understanding hinges largely upon the fact that I rarely wake her. Whether I’m coming home from the surf or leaving for the canal, the ungodly hours I keep are ignored, so long as they don’t affect her. The Cape Cod Canal is a 7-mile, man-made shortcut between Buzzards Bay and Cape Cod Bay in Massachusetts. The differences in tide timing and height between the two bays send water rushing through the canal at speeds as fast as 6 knots, but with extended slack periods that last about 30 minutes, when the two water bodies equalize before the current slowly creeps in the other direction. 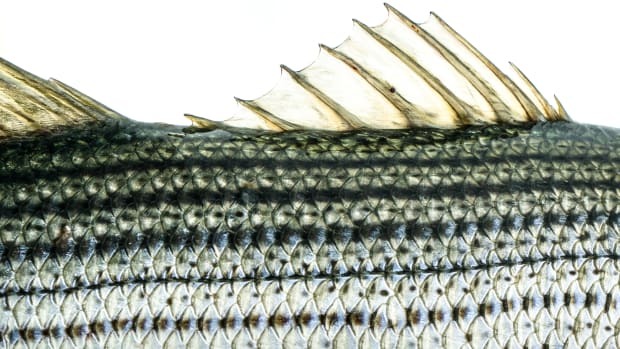 It’s the great power of these currents that draws baitfish into the “Big Ditch,” and huge numbers of striped bass follow them into what is the largest fish funnel on the East Coast. As I drive down the homestretch of MA-25, the unknown promise of the coming tide evokes boiling anticipation. It’s funny how easy it is to convince myself that things are lined up just right. Speeding down the dark highway, I have already arrived (in my mind) more than an hour ago. The images of the day to come are minced with images of the past. The sun rising behind a curtain of gray clouds, the colors of night melting away, the morning sunlight blending to reveal a full spectrum of familiarity and hope, waiting for the first signs of life. The rest of the game plays out on its own. Mackerel V-waking through the shallow water near the bank. The sun illuminating the world around me to the point that I know, instinctively, that it’s time to switch to a top-water plug. A long cast upcurrent, the large Guppy Pencil Popper splashing down and working slowly, ushered by the slowing tide. It steps tightly through an undulating rip and glides into the slick water on the inside of the seam. A small boil mounds behind the plug, and then the hit comes. Like a creaking stair in the middle of the night, the explosion shatters the quiet and rocks the anticipation of the 30 guys within earshot who have been waiting for someone else to show them that it’s time to fish. The line hisses as it comes tight. A large tail smashes the surface as the fish struggles to dive into the current. 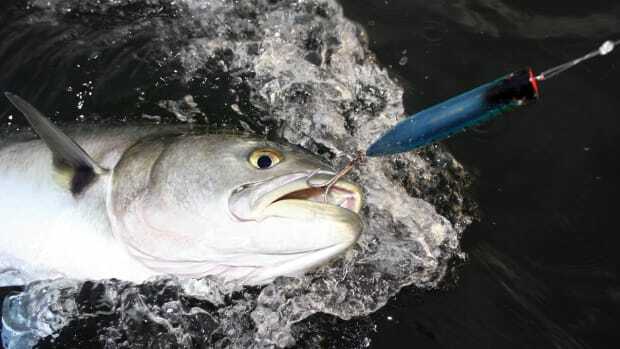 Click through the gallery below to see more striper action from the Cape Cod Canal. Photos by John Doble. I’m snapped back to reality as decision time comes: Should I cross the Bourne Bridge and fish the Cape side, or should I veer off the approaching exit and stay on the mainland side? I take the exit. 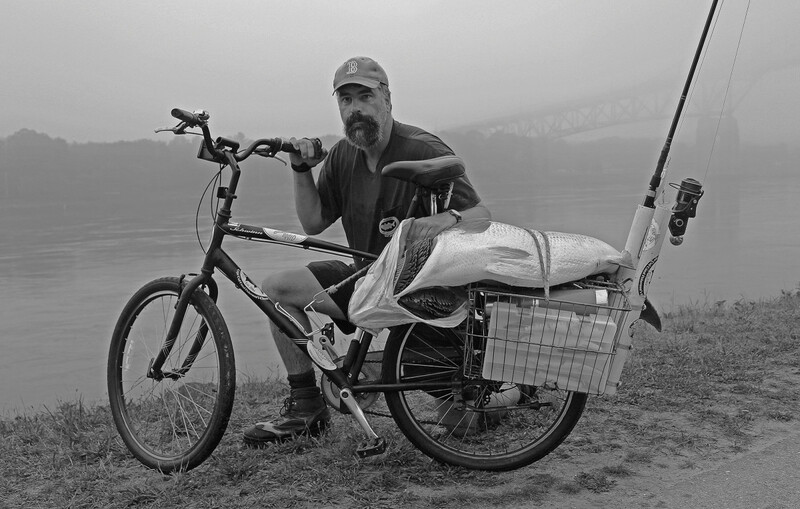 Pulling into the lot at the Herring Run — a centrally located landmark on the mainland side of the canal from which a large percentage of everyday anglers shove off — I see dozens of other fishermen hurriedly moving gear from their vehicles into the baskets of their bicycles. If you were allowed to see what the darkness hides, you’d find an envious arsenal of plugs, two to four rods waiting for their call in modified PVC pipe holders attached to the bike with pipe clamps, various jigs and shads, a Gatorade, a coffee, maybe a doughnut. The attitude is always the same. The faces are just silhouettes, dark and emotionless. Everyone is “New England quiet” — almost prickly. It’s a guy thing, I guess. With access roads tracing each bank and no motorized vehicles permitted, bikes are the accepted mode of transportation, making this fishery even more unique. Canal bikes, as they’re commonly called, are mechanical expressions of the people who ride them. Each vehicle in the lot, dome light glowing, has one leaning on a kickstand. Most have saddlebag-style baskets on the back; some have a basket mounted on the handlebars, too. I’ve even seen one with large, plastic food-storage “garbage cans” affixed with wood furring strips. It’s the subtle touches that make each one unique. There’s a grouchy old codger who rides with a 5-gallon bucket with plugs lining the rim resting in a seat meant for a child. You’ll see some bikes with bells and horns, some with funny license plates or bumper stickers, and some that look as if they could win a low-rider contest. The standby canal bike is a mountain bike — girls’ bikes are favored because of their low crossbar, which is easier for wader-clad (or just old and tired) feet to clear when getting on and off. A paperboy-style wire basket straddles the rear wheel, with PVC rod holders affixed to both corners. The canal bike is one of the last remaining fingerprints of surf-casting ingenuity. Seemingly everything else has made the rapid transition to commercialization. Canal bikes are 100 percent basement-engineered, and the modifications are passed from angler to angler. The kickstand systems are a particular marvel of angler ingenuity. Every bike has a main kickstand and a backup — some even have a third. The main kickstand is the same one you’re picturing, a piece of bent rod threaded through a collar and fitted onto the bottom of the frame. But the extra weight of the rods and gear makes the bike susceptible to tipping over in a stiff wind. The first line of defense is a golf ball drilled out and epoxied onto the end of the wire kickstand. This modification keeps the kickstand from digging into the soft grass that grows along the banks. And most of us have learned the hard way that further modification is required. The fallback is a length of shovel or hockey stick handle, with an angled cut at one end and a notch in the other. The notch supports the basket, and the angled end provides maximum grip, digging in when the wind blows. Another common addition is a length of pool noodle sliced and fitted over the basket’s rim, used as fast-access storage for favorite lures, the hooks jabbed into the foam. And there are dozens of other tweaks and solutions, too. I could write a whole story about the methods I’ve seen for toting a hot coffee. 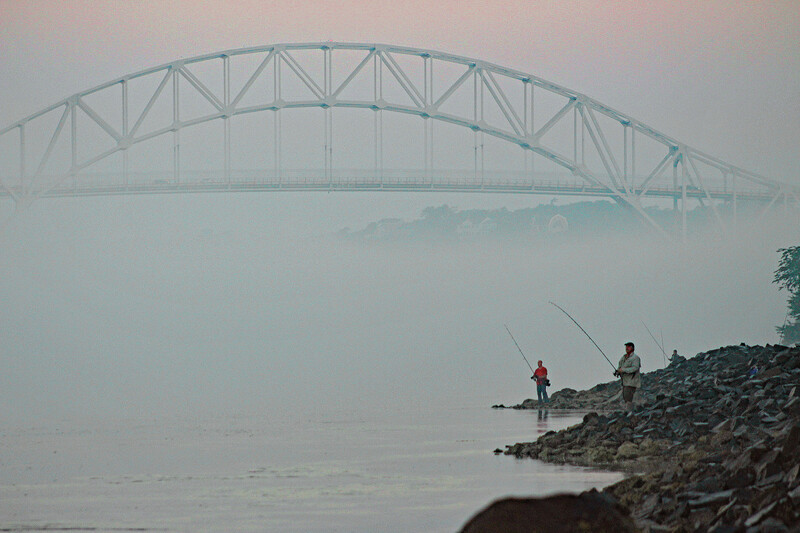 A couple of canal sharpies work the current near the Sagamore Bridge on a foggy day. One by one, the doors slam, and bikes with rods splayed out like the herls of a strutting peacock glide, rattling quietly, toward the access road. Leaving the lot in darkness turns the ride into a prayer: that the spot you have in mind is not already occupied, that being late for work will be worth it. Later in the morning, the ride becomes a mission. If the bite was good, you’re speeding with the current to get back in front of the fish. If the bite was off, your mission is to find out if you were in the wrong place. 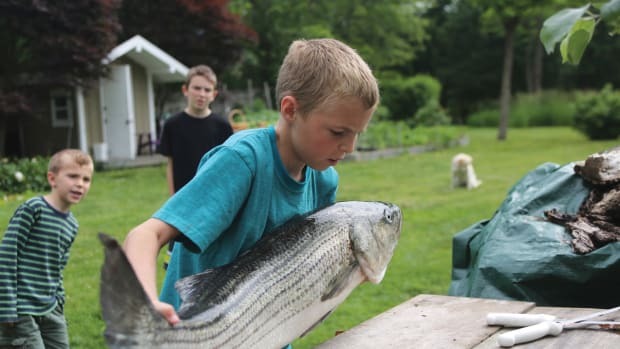 The geography of the area is what makes it such an amazing place to fish, particularly during the spring striper migration (see the sidebar on this summer’s fishery). 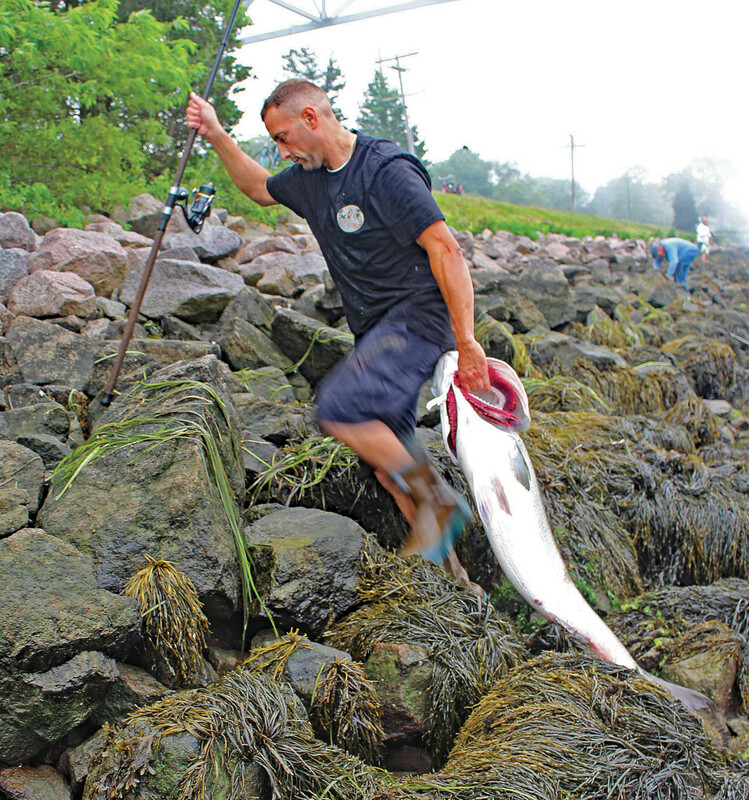 When a body of fish enters Buzzards Bay, it is essentially funneled through the canal. (Choke points are elementary in so many styles of fishing, and the canal has to be one of the world’s largest.) 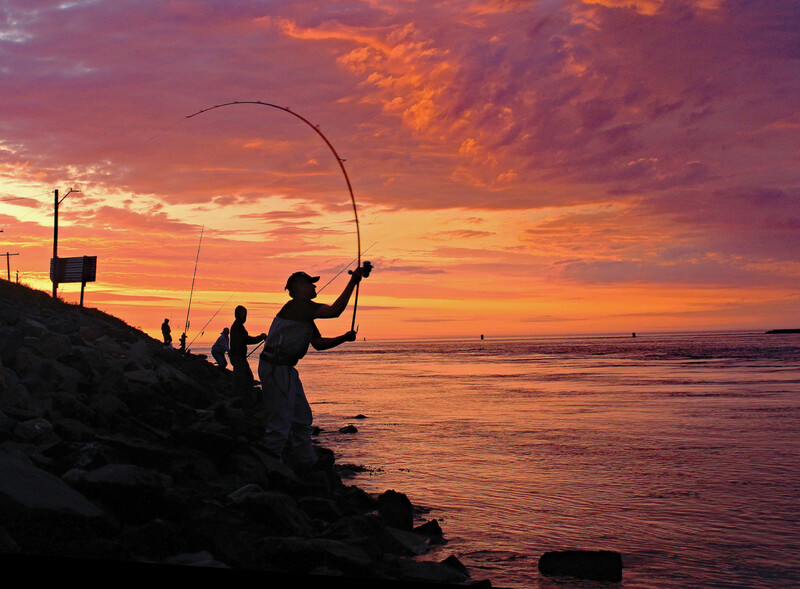 Fishermen come from all over the country each year because of an astronomical anomaly known as the breaking tides. These tides occur when the current turns east (coming from Buzzards Bay) within an hour or so of first light. 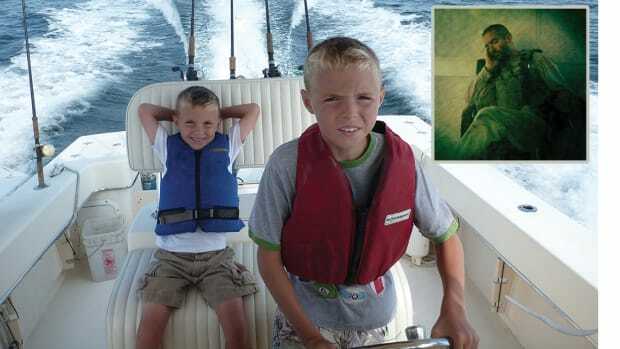 Every set of tides is different, but when you hit one right, you’ll see scores of fish, some 40 pounds or better, drifting through with the tide, smashing mackerel, herring, whiting, butterfish and other baits on the surface. This natural occurrence sets up an aggressive feeding scenario that makes these fish susceptible to being caught on surface plugs in large numbers. There really aren’t any secret spots in the canal, at least if plugging is your game. 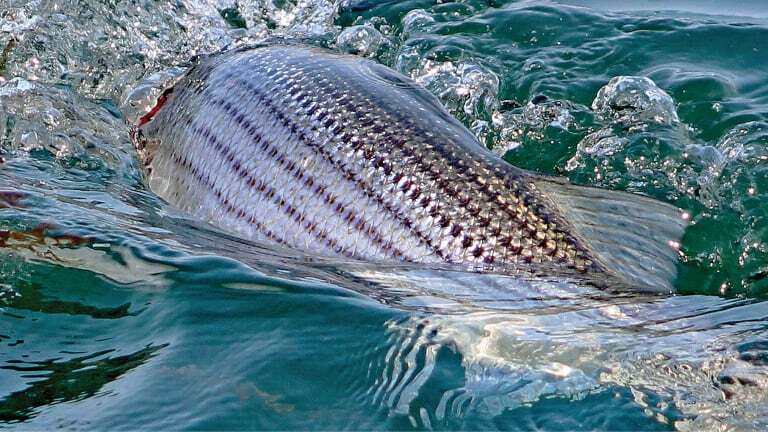 Certain rips and eddies hold fish longer, and there are likely areas where stripers might corral bait when the tide comes up to full speed. 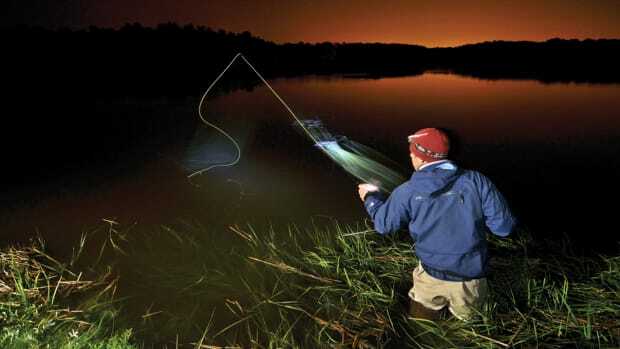 But the basic makeup of a canal bite is that a percentage of the fish enter the canal in the dark and hold on the bottom until the tide slows. 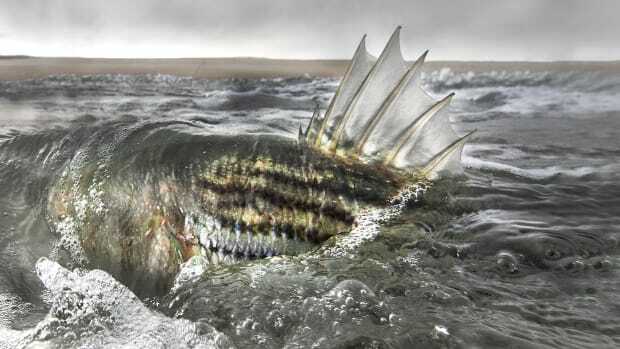 When sunlight begins to penetrate the water, the fish push bait up through the water column, and packs of bass begin showing on the surface, punishing bait as they drift through the lazy current. On the best mornings, more bass enter the canal from the west, and waves of bass move through, taking down anything that moves as they go. The hits are vicious, and the battles with big bass are epic, as the fish have the upper hand with depths of 36 to 50 feet, stepped ledges, riprap and current to use to their advantage. 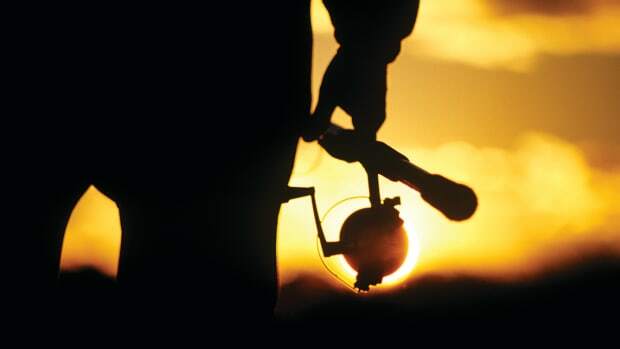 When the fishing has been good, many anglers stay long after the bite has subsided to trade war stories from that morning. It’s almost a party atmosphere on the best days. It’s just as easy to understand why the same people turn frosty when the fish don’t show. Sacrifices are made, relationships are strained, sleep is lost because, unlike fishing in most other places, you can’t not go and not know what happened. The canal gets more social media coverage than Trump, Hillary and Bernie combined when it’s on. And missing out feels like a kick in the cojones. As the sun reaches the 9 o’clock position and the dust of a great bite settles into the quickening tide, a buzz hangs in the air. After a few last prayer casts, I climb the steep embankment to join the other bikes on the path, hurrying back to the normal people in their normal day. Many bikes plod along, displaying wide tails draped over the sides of their baskets. Back at the lot, wide-eyed anglers are barking blow-by-blow accounts back and forth. Their conversations snap at a pace that only cocaine could keep up with — this is the adrenaline, what we wake for. This is why so many anglers travel great distances to be here. Bobby Ellinas slides a 54-pounder over the wrack weed and up the riprap. This past July was one of the best months I can remember in my nearly 20 years fishing the Cape Cod Canal. Great months are often defined by one or two great tides, but we saw three multiday events in the span of July’s 31 days. 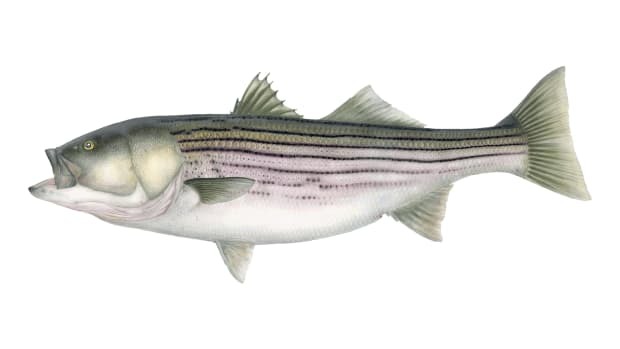 It was an odd pattern for the month because the stripers seemed to be migrating from the south, a phenomenon that usually slows to a trickle by early summer. 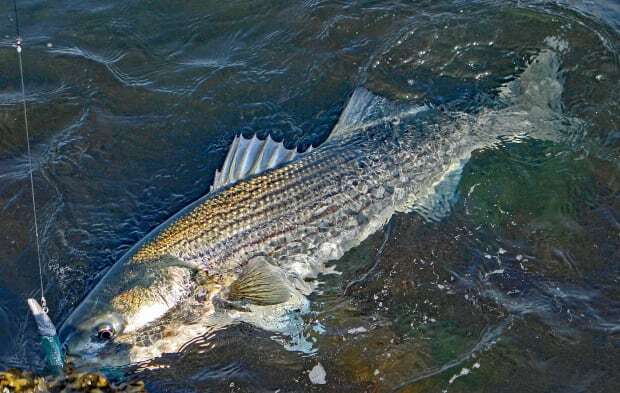 With huge masses of bass backing up in the bottleneck at the west end of the Big Ditch, each east tide carried a heavy payload of big stripers. Mackerel entering the canal from the east end were there to fan the flames as schools of 20- to 50-pound bass gorged themselves. At least twice, blitzes spanned the canal’s entire 600-foot width. For hours at a time it was possible to throw a cast knowing that your plug would be engulfed within seconds. Hundreds of canal fishermen topped their best bass in July, and many more hearts were broken by a line gone limp when a hook pulled, a split ring opened up or a leader gave way. 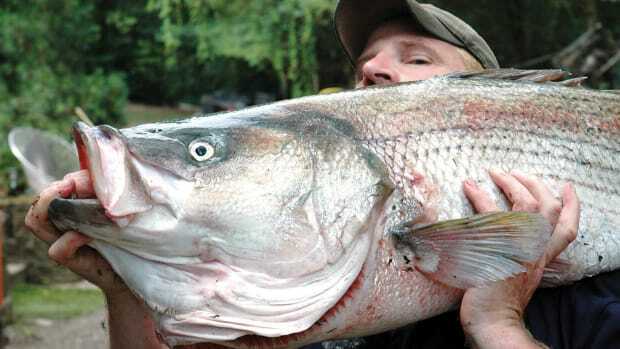 Talk about addictive; if casting into schools of big stripers feeding aggressively in heavy current doesn’t get you excited, you may need to lower the dosage on your nitroglycerin pills.